Pectocarya heterocarpa and P. peninsularis are very similar species, and are difficult to separate unless you know exactly what to look for. Even then, until you are intimately familiar with the distinguishing characteristics, it can still be difficult to separate them. This page shows their distinguishing characteristics, their ranges, and pictures of both species showing some of their variation. There is no easy killer distinction between these species, but they differ in a number of characteristics. Here is how I try to differentiate them in the field, in order of ease and reliability in checking, which assumes that these are the only two species in play. If you aren't sure whether you have one of these two species, see Pectocarya species of southern California. If you see a plant with a number of flowers easily visible from a standing position, it is almost surely P. peninsularis. Of course, the difficulty here is knowing exactly what "easily visible" means. Furthermore, if the flowers are not easily visible, it could still be either species. So this will only work to recognize some plants of P. peninsularis. But it works great to immediately recognize many plants of P. peninsularis at a glance from a standing position. 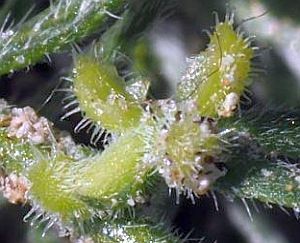 If you are able to see the pedicel in fruit clearly enough to see whether it is only attached to the nutlets at the common point where each nutlet originates (P. peninsularis), or whether it is instead attached to one of the nutlets (P. heterocarpa), this is the easiest discrimination. In fact, it is a killer distinction, since this is part of the key to discriminate the two species. Mature fruit is not needed; you can see this difference even in developing fruit (but not in flowers). 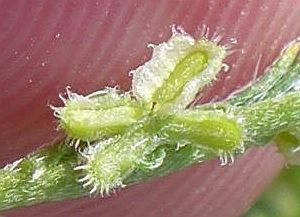 Even better, P. heterocarpa is the only species of any Pectocarya (including the recently-defined P. anisocarpa) that has pedicels attached to one of the nutlets and with biplanar pairs of nutlets. 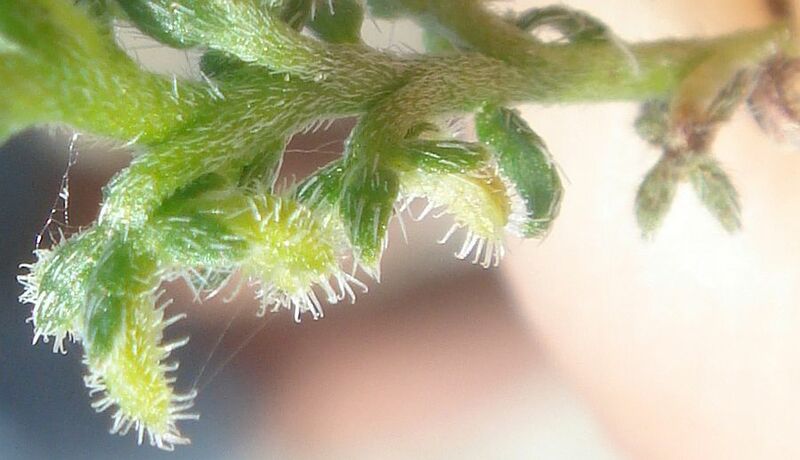 So if you can observe those two things, you've nailed your plant as P. heterocarpa, even if you can't recognize anything else about the nutlets. However, determining where the pedicel attached to the nutlets was difficult for me to recognize in the field when I was learning these species. But after seeing many examples of the two species, and knowing what to look for, it is now a piece of cake for me to see in the field. So this will possibly be thoroughly confusing for you at first until you get intimately familiar with what you are looking for. If you can't use the above to determine your plant, if you have mature nutlets, check for one pair of nutlets that are strongly incurved. 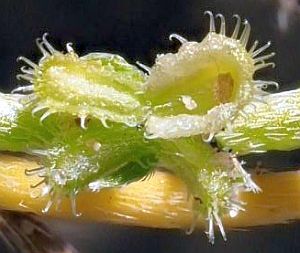 Strongly incurved nutlets are those of P. heterocarpa; flat or weakly curved nutlets are those of P. peninsularis. My guesstimate is that if you have good mature nutlets, you can recognize the nutlets of P. heterocarpa at least 3/4 of the time from a single fruit, and much more often if you examine multiple nutlets on a plant. The problem comes if you only have a picture of a single fruit, and it is not so clear. 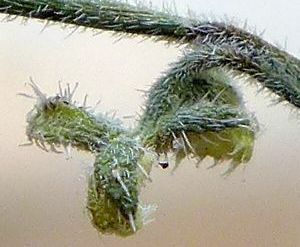 Not every fruit of P. heterocarpa has strongly-curved nutlets. You cannot use immature nutlets for this test, since the nutlets are still unfolding. Another difficulty is that you need mature nutlets that are not the lowest nutlets on the stem, since the first-formed nutlets, the ones near the base of the stem, for both of these species are weird, often being deformed, or having some nutlets missing in each fruit, or simply not following the pattern of later nutlets. Even some of the later nutlets are weird, too. If you are still undecided about the species, do a picture match of your nutlets with these pictures. The gestalt of the nutlets is different enough that you should be able to decide which set fits your nutlets best. 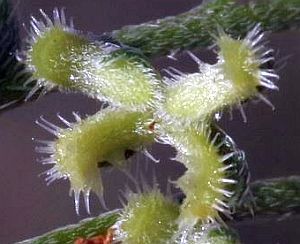 Note that the gums of P. heterocarpa are variable in width, whereas the gums of P. peninsularis are more uniform. So if you don't like the match with P. peninsularis nutlets, you probably have nutlets of P. heterocarpa. 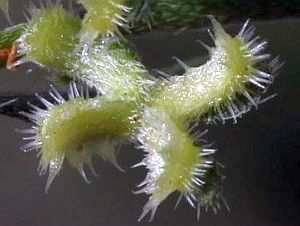 When P. heterocarpa has thick gums, it also usually has distinct lobes on the gums, with the bristles emerging from the tip of the lobes. The gums of P. peninsularis are basically entire except for the bristles, with only weak lobes at best. 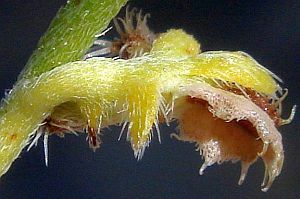 If you don't like the match to either set of pictures, take a look at other nutlets on your plant, or go back to Pectocarya species of southern California to see if you have a species that is not one of these two species. 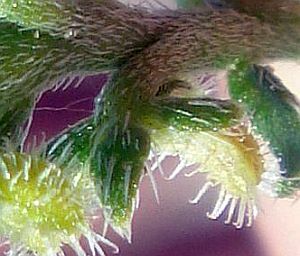 One bottom line is to always photograph more than one set of nutlets, and try to photograph nutlets from the center of the stem. 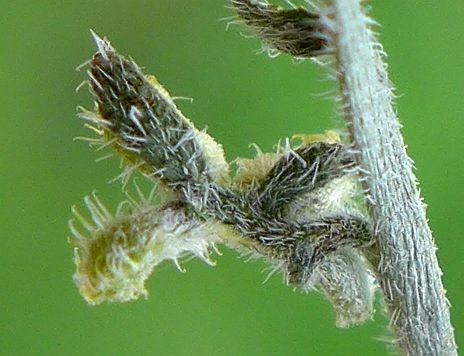 Even better, first look at the nutlets on the plant with a hand lens, and only then photograph the best examples you see that have four nutlets from the middle of the stems. If you have a young plant of these two species, with stems having only a few mature nutlets at their base, you will probably not be able to use the nutlets to separate them. Pectocarya heterocarpa is a widespread species in southern California, whereas until recently there were very few known locations of P. peninsularis, whose range is primarily in the north half of Baja California, befitting its scientific name (for the Baja peninsula) and its common name of Baja pectocarya. The 1974 Flora of Southern California by Munz does not even list P. peninsularis. Beauchamp, in his 1985 Flora of San Diego County, gave P. peninsularis as being rare; below 300 m; northwest of Narrows; Borrego Valley. 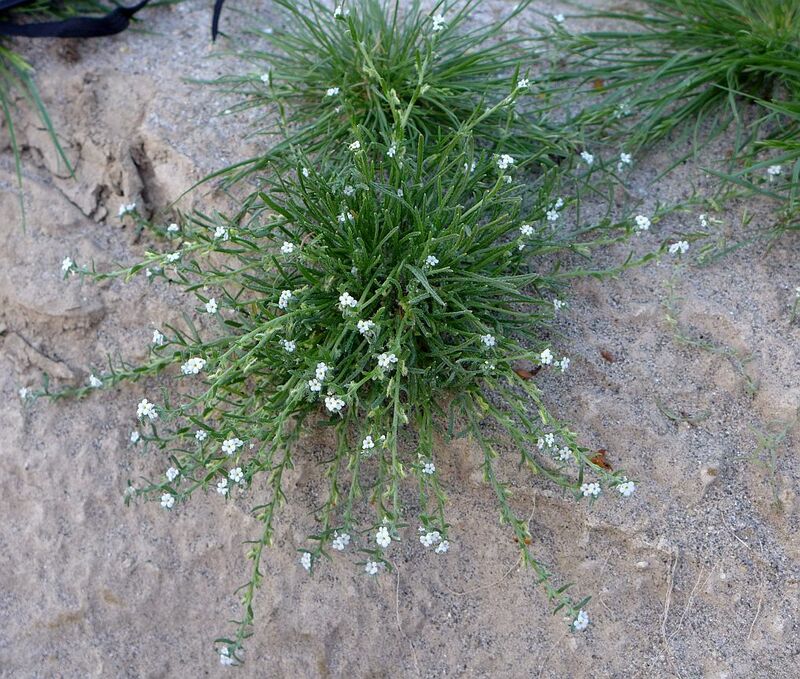 Oddly, though, the 1985 Duffie Clemons flora of Anza-Borrego Desert State Park does not include that species. The 1993 first edition Jepson Manual gave it as occurring in DSon. 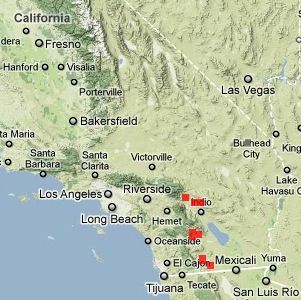 When I searched for vouchers on 14 March 2008, I found a total of only eight vouchers in California, five in San Diego County, all in the Carrizo Valley, and three in the Coachella Valley of Riverside County. 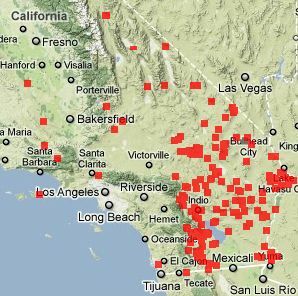 However, there are now 23 vouchers of this species online, with three vouchers in the Borrego Valley and another in Ocotillo, adding two new locations to the voucher distribution. This improved knowledge of the distribution of this species has resulted from at least two sources. First, the San Diego County Plant Atlas project has resulted in a number of new specimens from different areas, with all the determinations made by Jon Rebman. Second, the Pectocarya website by Mike Simpson, and the results of his and Ron Kelley's study of this genus, have resulted in better understanding of the characteristics of these species for voucher determinations. 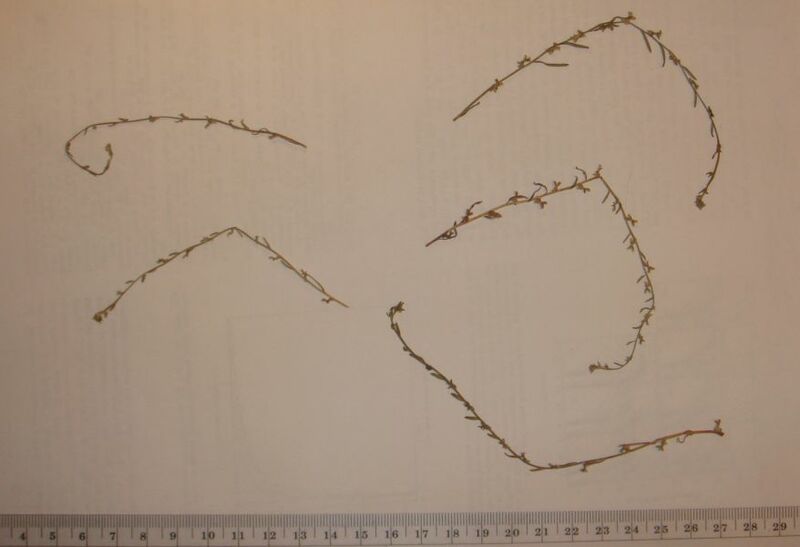 Perhaps the main difficulty in recognizing that P. peninsularis occurred more frequently in southern California was that it is quite similar in many ways to P. heterocarpa, enough so that even the determination of vouchers is somewhat difficult. The 1993 Jepson Manual key is in fact misleading or incorrect for two of the three characteristics used to separate these species in the key, at least for southern California specimens, and the illustrations there for the species don't adequately show the differences in the nutlets. 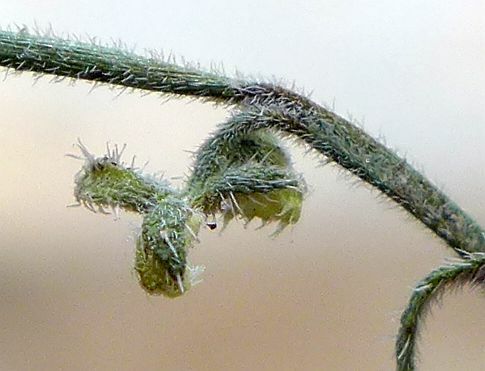 Although I occasionally had come across plants in the Borrego Desert that seemed a bit different from usual P. heterocarpa, primarily in having a pedicel not partially fused to one nutlet, they never satisfied more than that one of the three characteristics used in the Jepson Manual key. Worse, their nutlets didn't look any more like the Jepson Manual illustration for P. peninsularis than they did that of P. heterocarpa. 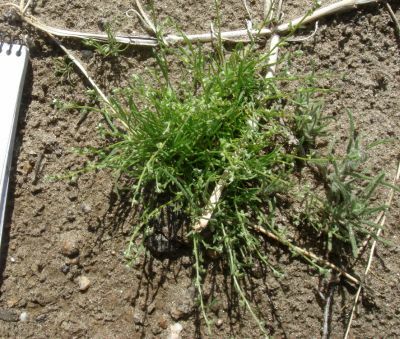 Furthermore, after finding a clear P. heterocarpa along Henderson Canyon Road, along with a voucher of "P. peninsularis" from that same location, I asked Mike Simpson to take a look at that voucher, and it turned out to be misdetermined P. heterocarpa. Hence I had largely given up on the possibility of finding P. peninsularis in the Borrego Desert. 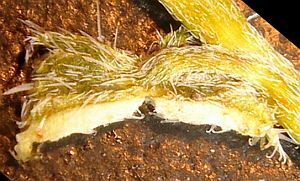 Fortunately, on 13 March 2011, on a survey with Mike Crouse and myself, Kate Harper found a specimen that appeared to have the free pedicel characteristic of P. peninsularis, and strongly encouraged me to examine it further at home to check it out. This time, when I found the pedicel of this specimen free of any nutlet, I checked the pictures on Simpson's page. To my surprise, the nutlets shown there looked very similar to the nutlets on this sample, and quite different from the nutlets of P. heterocarpa. Furthermore, in checking vouchers, I found the new vouchers of P. peninsularis from the Plant Atlas, including one from essentially the same location as Kate's plant. I then went through my pictures and vouchers of my previous "P. heterocarpa" determinations in the Borrego Desert, which was the motivation for producing this page, and the original source for the pictures here. Fig. 3. Plot of voucher locations for P. heterocarpa. Fig. 4. Plot of voucher locations for P. peninsularis. The plots above were from data provided by the participants of the Consortium of California Herbaria (ucjeps.berkeley.edu/consortium/; Sun Mar 20 2011). 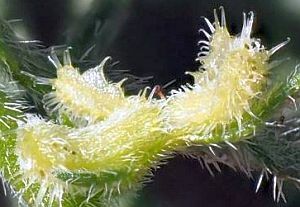 It is possible that some of the cismontane locations from Santa Barbara toward Fresno are actually a species only described in 2013, P. anisocarpa. See also the distribution maps for Baja California in Simpson's page on P. peninsularis. Size of plant. I've found both species growing side by side in two different locations. 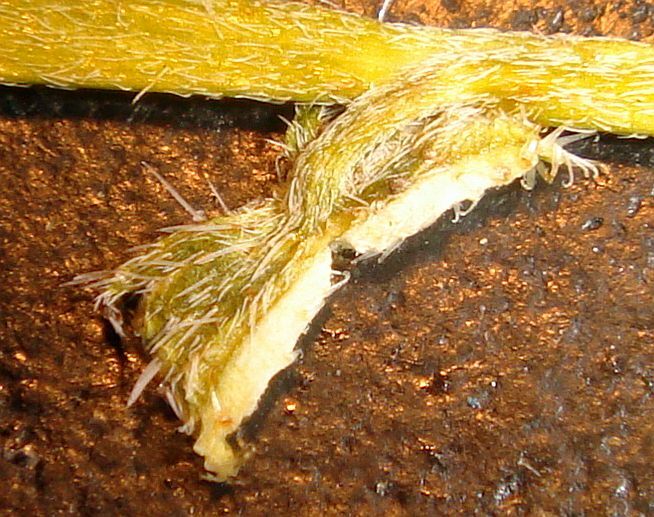 Interestingly, in both cases, the stems of P. peninsularis were significantly smaller and more delicate than those of P. heterocarpa. See pictures of specimens from Coyote Canyon Wash (P. peninsularis on left), and from Collins Valley (P. peninsularis on bottom). However, more recently in a third location that had received October rain, the difference in size of the plants was not as strong. Flower size and number of flowers. P. peninsularis is said to have the largest flower size of any Pectocarya (Guilliams et al 2013), and it often has many more flowers open at the same time. However, this is only true of the earlier flowers; the later flowers are the same size as P. heterocarpa flowers. So if you see plants with large flowers, they are almost surely P. peninsularis. 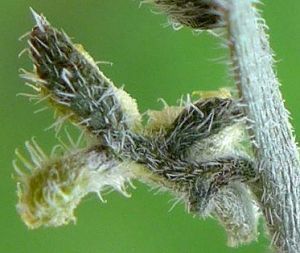 But if you see plants with small flowers, you need to check the nutlets to distinguish the species. See Fig. 5 for the most extreme comparison. Fig. 5. Blooming plants of P. heterocarpa (left) and P. peninsularis (right). 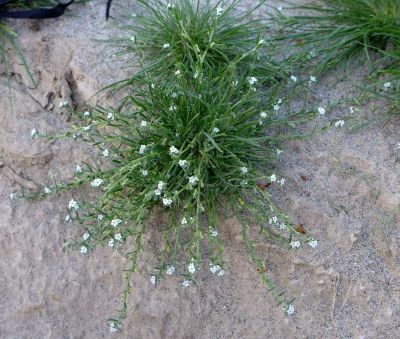 Note the P. peninsularis plant has many more flowers, and the flowers are significantly larger. 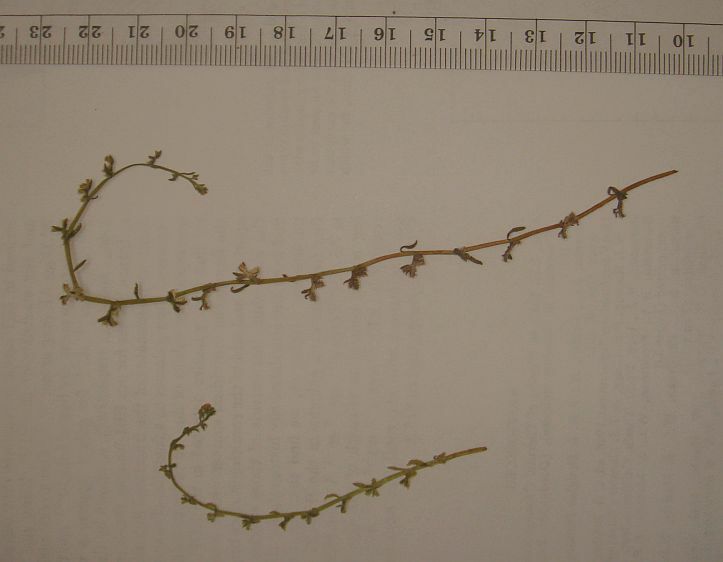 However, later flowers of P. peninsularis are smaller, and are no different from some flowers of P. heterocarpa. Click on the pictures for larger versions. Number of fruit with four nutlets. Many, but not all, of the stems of P. peninsularis I've seen have relatively few fruit with the full four nutlets, with many more fruit with one to three nutlets. 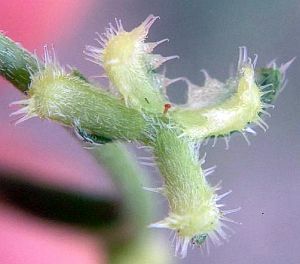 In contrast, most of the stems of P. heterocarpa have many fruit with four nutlets. However, this needs to be checked on more plants to see how well this holds up. 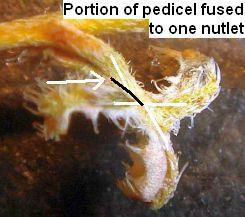 Pedicel attachment to the nutlets. As seen in the pix at the top of this page, the pedicel of P. peninsularis attaches to the nutlets only at the point where all the nutlets originate, coming in at an angle close to perpendicular to the plane of the nutlets. 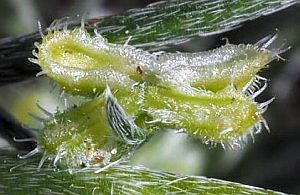 In contrast, the pedicel of P. heterocarpa "slides in" to that same location, coming in at a very small angle to the plane of the nutlets. 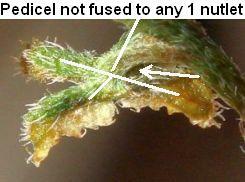 The difference in the angle is because almost half the pedicel is fused to the nutlet closest to the stem. Fig. 6. 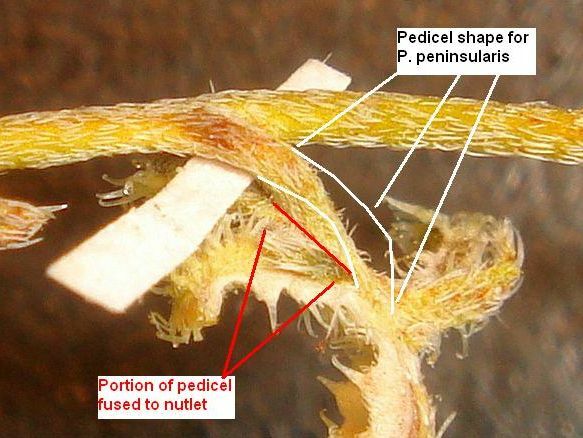 Picture showing the fused portion of the pedicel for P. heterocarpa, with an illustration of the shape of the pedicel for P. peninsularis. The piece of paper has a width of 1.0 mm, and is used to illustrate the free portion of the pedicel. Note that the pedicel for P. heterocarpa is not evident at the point where all the nutlets meet, which is the only point where the pedicel of P. peninsularis meets the nutlets. See Fig. 10 for a number of photographs of the pedicels. Angle between the pairs of nutlets. This was what confused me the most about P. peninsularis, and was the strongest characteristic that prevented me from recognizing it before. The Simpson / Jepson Manual Second Edition key says that the nutlets of P. peninsularis are gen straight in 1 plane, which is not correct for the specimens I've seen, whereas the nutlets of P. heterocarpa are curved in 2 planes. Fig. 7. 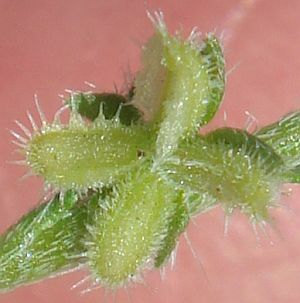 Picture showing the angles between the pairs of nutlets of P. heterocarpa. 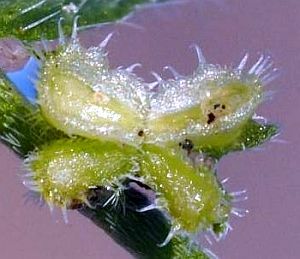 If you think of the nutlets as unfolding from their original joined position in the ovary, they unfold in two pairs, and the pairs are rotated from each other by an angle close to 90°. 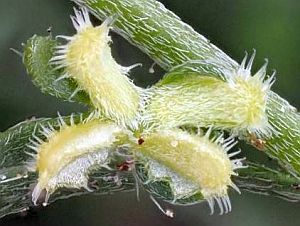 In the fruit at the right, imagine sighting along the upper pair of nutlets from a position immediately behind the rightmost nutlet, so that the other one in its pair is directly behind it. 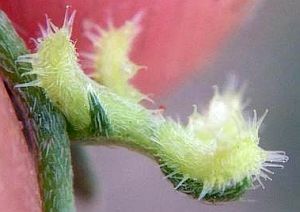 The inside part of those nutlets, away from the calyx lobes on the other side of them, would then face up. From that position, you would then see that the other pair of nutlets face to your left, at an angle of 90° from the upper pair of nutlets. That angle is explicitly shown as a right angle (the little square inside two perpendicular lines) on the set of nutlets at the left in the picture. The nutlets I've seen for P. peninsularis are most distinctly in two planes, but at an angle of about 60° instead of 90°; see Fig. 8. It is very difficult to distinguish the difference in these angles, so although this difference exists, it is not very useful unless you can make that distinction. Mike Simpson says that he has found it hard to tell the difference between these species for this characteristic as well. Fig. 8. 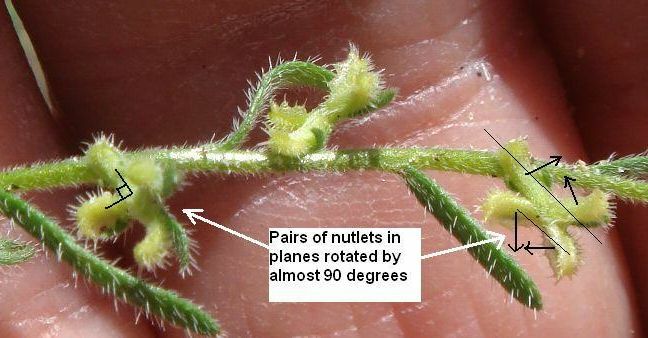 Picture showing the angles between the pairs of nutlets of P. peninsularis. The upper pair of nutlets faces essentially straight up, whereas the lower pair of nutlets faces toward the camera, making an angle closer to 90° than to zero degrees. Curvature of the nutlets. This is a strong distinction between the species, but it is not well described by the Simpson / Jepson Manual Second Edition key. 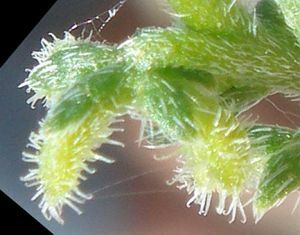 The nutlets of P. heterocarpa are said to be curved, one pair incurved, the other pair recurved, whereas the nutlets of P. peninsularis are said to be gen straight, all spreading ± flat. 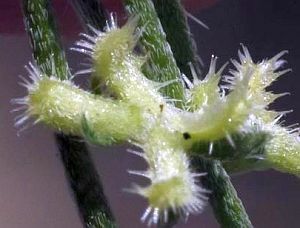 The sense of this key is correct; the nutlets of P. heterocarpa are significantly more curved than those of P. peninsularis, as seen in the pictures at the top of this page. 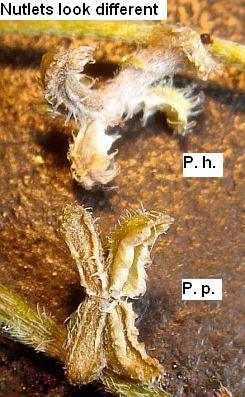 However, some of the nutlets of P. peninsularis are clearly curved, as seen in the pix above. 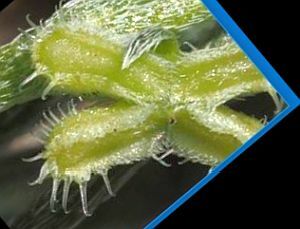 But rather than being curved throughout, like the nutlets of P. heterocarpa, they are closer to appearing bent somewhat at one point in the middle of the nutlet, as if hinged at that point. See photographs of the nutlets for the two species. Ornamentation of the nutlets. Ornamentation is just a word to describe what the nutlet inner surface looks like. For Pectocarya nutlets, the ornamentation consists of what looks like a gum line, and what look like teeth projecting out of the gum line, along with bristles coming either from the gum line or the teeth. I've always had trouble with the Jepson Manual First Edition key in how it describes the nutlets, and have relied more on the illustrations in the Jepson Manual. I suggest you do the same, and simply look at the pix on this page to see the fairly clear difference between these two species. 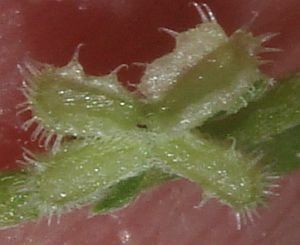 Note that the gums of P. heterocarpa are variable in width, whereas the gums of P. peninsularis are more uniform. 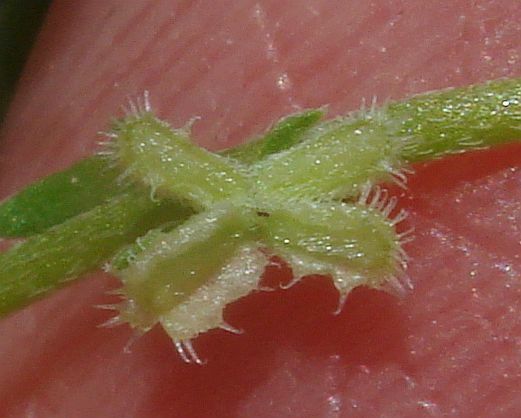 Sepal shape. 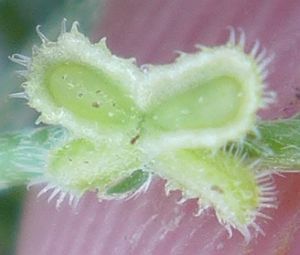 The keys state that the lower 3 sepals are ± equal for P. heterocarpa, and unequal for P. peninsularis. I haven't seen any real difference between the species in the few fruit I've analyzed in detail. Mike Simpson says that he has found it hard to tell the difference between these species for this characteristic as well. More information. For more information about both of these species, and much better close-up pictures of the nutlets, see the Simpson pages on P. peninsularis and P. heterocarpa. On 28 January 2019, I went through the iNaturalist observations of these two species from the Borrego Desert, to get some good photographs to display the variation in the nutlets for our two species. 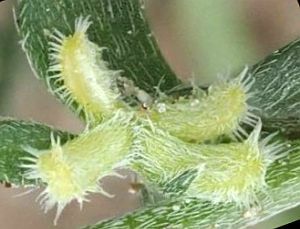 The following photographs are crops of some of the photographs from iNaturalist. Click on each of the pictures to go to the source iNaturalist observations. Because there were many fewer P. peninsularis observations at iNat, I've used some of my photographs to fill in the table. 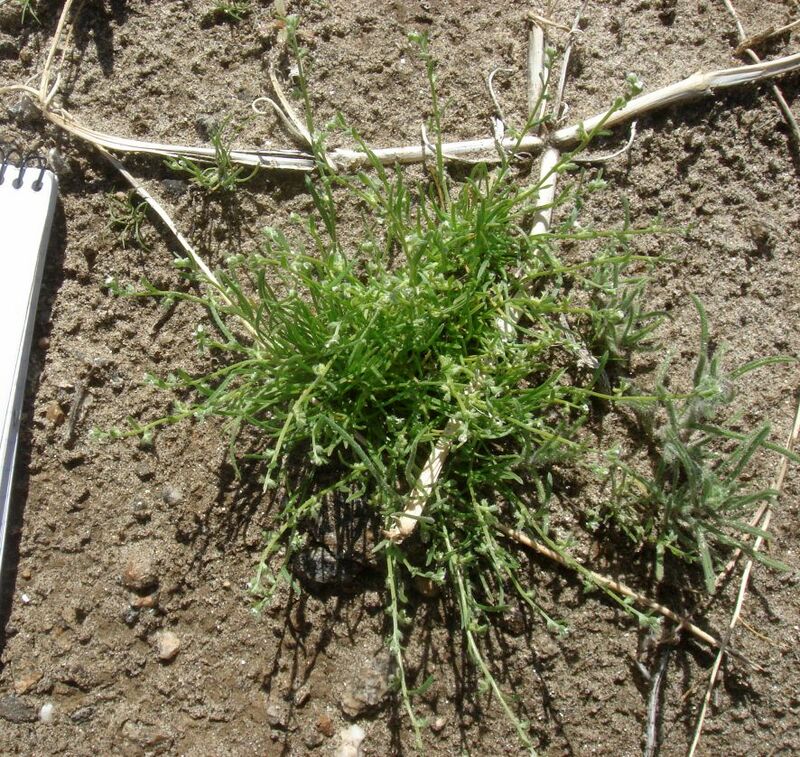 I've also included in the table two iNat observations that were originally determined as P. heterocarpa, but turned out to be P. peninsularis. Fig. 9. Left: P. heterocarpa. Right: P. peninsularis. Click on the pictures (except for my pix) to go to the source iNaturalist observation for each one. Fig. 10. Left: P. heterocarpa. Right: P. peninsularis. Click on the pictures for larger versions.